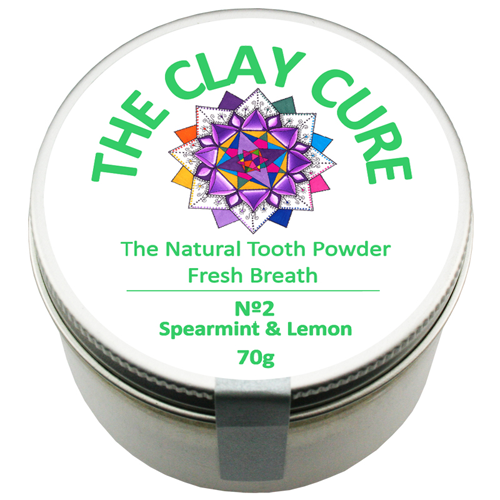 The Natural Tooth Powder - No.2 Spearmint & Lemon - 70g by The Clay Cure Co.
Tooth powders have been around much longer than toothpaste. Many ancient cultures cleaned their teeth by chewing on chalk and clays as a natural and effective method of oral health care. 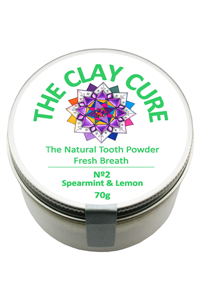 Clay Cure's Natural Tooth Powder No.2 (Spearmint & Lemon) will improve your dental hygiene, regulate vital pH levels and help re-mineralize enamel. It has natural antibacterial and antiseptic properties and is effective against the formation of tartar and plaques. All of Clay Cure's Natural Tooth Powder blends work in a synergistic manner to provide an efficient formula for natural oral health. They are made with pure Ecocert clays and salts and will boost your mineral intake with beneficial minerals such as calcium, silica, magnesium, manganese and more. Clay Cure's Natural Tooth Powder combines the finest natural ingredients, contributing to healthy teeth and the promotion of fresh breath. Sprinkle ¼ tsp onto wet toothbrush then brush as normal. Recommended to use not less than 2 times a day. Montmorillonite clay,** Calcium carbonate, Kaolin clay,** Sodium bicarbonate (alu. free), Spearmint and Lemon oil,* Xylitol, Himalayan rock salt. Free from: SLS, gluten, glycerin, flouride & parabens. Suitable for diabetics & children.